With funny and unique faces our Sock Monkeys can hide inside each other like a set of Russian Nesting Dolls. 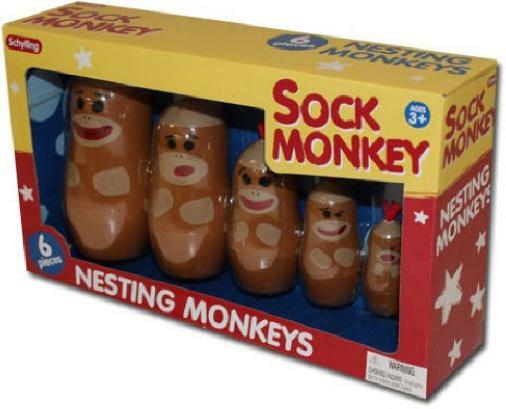 Fun to open and silly to stack, you’ll love to play with our set of 6 Nesting Monkeys. Measuring from 5 inches to 1.25 inches, each Sock Monkey opens at his waist and wears a bit a red hair on his head. What a cute and happy classic toy with fun sock monkey details! Collect all of our Sock Monkey toys!